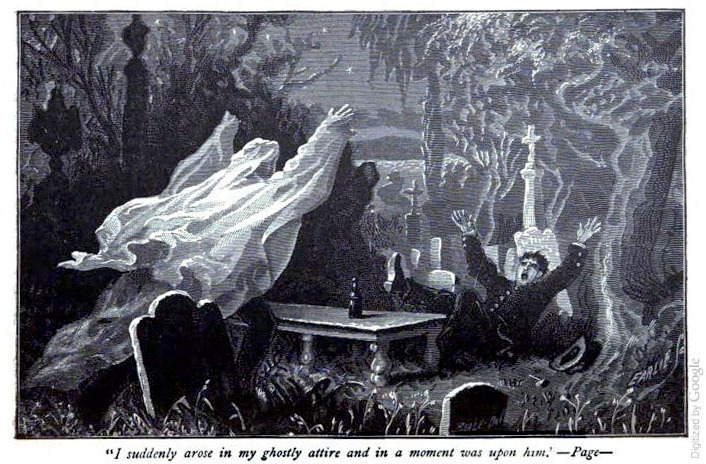 This illustration is from Allan Pinkerton's story "The Ghost in the Cemetery" in his book Criminal Reminiscences and Detective Sketches, from 1878. Pinkerton tells the story of disguising himself as a "ghost" to play a practical joke on one of his detectives who seemed uneasy during his lookout for grave robbers in the Catholic cemetery. The picture whimsically illustrates some features of the cemetery on the lake. In the story, Pinkerton describes a feature of the eastern edge of the Catholic Cemetery as a “heavy copse of scrub oak and willow that lined the shore”, and wrote of an Arbor Vita ornamenting a family lot. See the whole story and the entire book here, on the Google Book Search TM Web Site. Below, in an excerpt from the story, Pinkerton gives the modern reader a rare glimpse into the landscape and its transformation twenty years later. Already, in 1878, he describes mansions upon the Catholic cemetery grounds, which will one day become the Gold Coast. In the summer of 1857 there was located, along the shore of Lake Michigan, within the limits of the city of Chicago, a high, narrow, sandy strip of land, then occupied as a cemetery, known as the “Old Catholic Burying Ground,” or the “Old French Cemetery,” from the fact that within it reposed the remains of hundreds who had died in the Catholic faith, as well as large numbers of the early French settlers and their half-breed progeny. Quaint inscriptions and devices were there seen, and everywhere upon the great cenotaph or monument, or upon the most modest of graves, the cross, in every manner of design, somber with black paint or bright with fanciful colors, or still white in chiseled marble, could be found. The old cemetery has since been removed; and where once stood, in silence and mournfulness, the city of the dead, now are seen splendid mansions of the rich, with magnificent gardens and conservatories, or, in that portion which has been absorbed by Chicago’s beautiful Lincoln Park, handsome drives, fine fountains, exquisite lawn or copse; and over all the old-time somberness has come an air of opulence, beauty, and healthful diversion. Scarcely could a greater change anywhere be noted than from the former solemnity and desolation to the present elegance and artistic winsomeness. In the time of which I write Chicago was much younger than now. Twenty years have made the then little city the present great metropolis. All the great enterprises which now distinguish the city were then in their infancy. Particularly were all institutions of learning having a hard struggle to creep along; and the medical schools, then just started, were put to every possible shift for the funds necessary to an existence; and there being often no legal provision for securing “subjects” for dissection, the few students pursuing their course of study were compelled to secure these essential aids to their work by grave-robbery, that greatest and most horrible desecration imaginable. The old French cemetery being situated less than a mile and a half from the river – which then as now was called nearly the geographical center of the city – the temptation to steal newly-buried bodies from so convenient a locality proved irresistible, and the city was soon startled by a succession of grave-robberies which excited general indignation and alarm. Coupled with this indignity to the dead and the friends of the dead, some malicious persons had entered the cemetery and wantonly desecrated graves from which subjects had not been taken. Some held that this had been caused through religious ill-feeling, others that it was the result of pure mischief on the part of such persons as had been concerned in other impudent and graceless grave-robberies; but the result of it all was that so much public wrangling and excitement occurred that a committee of prominent gentlemen, including some of the city officials, called upon me, and desired me to take such measures as would cause a cessation of the outrages, and bring to punishment whoever might be found to have been the perpetrators of the same.